DCC-3200 Features: -Charcoal water filter and gold tone filter included. -Thermal carafe with drip-free pour spout and comfortable handle. 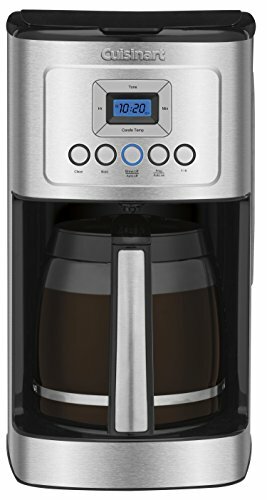 -Fully automatic with auto-on and shutoff, self cleaning function and 1-4 cup setting. -Brew Pause™ feature lets you enjoy a cup of coffee before the brewing cycle has finished. Product Type: -Automatic machines. Color: -Grey, Black. Dimensions: Overall Height – Top to Bottom: -14″. Overall Width – Side to Side: -9″. Overall Depth – Front to Back: -7.75″. Overall Product Weight: -9 lbs.